Construction: Weights 500gm or blow (in f1 f2 m1 m2)are made of sheet metal and are one-piece construction with one side turned up to make them easy to handle with forceps. The shape of denotes the nominal value according to the table below. 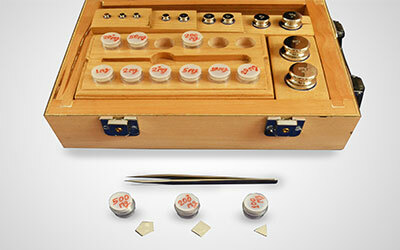 Milligram weights are marked with their nominal value with the exception of Class F1 F2 . One-piece: single uniform piece of stainless steel, the weight has no other material added to it, and it has no method of adjustment other than polishing. 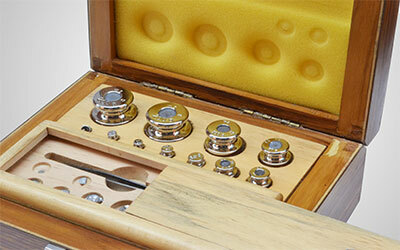 Polishing: All surfaces are polished to a perfect, mirror-like finish and meet or exceed OIML R 111 specifications. 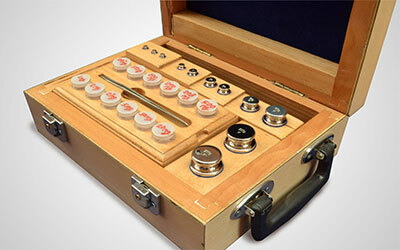 Suggested markets: Suggested Markets for OIML Precision Weights include, but are not limited to, pharmaceutical, forensic, chemical and nuclear industries. 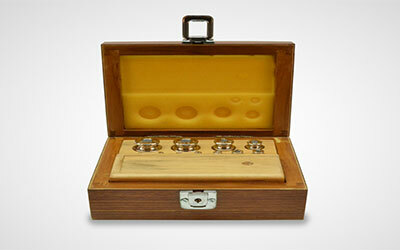 Casing: Individual/ set of weights packed in polished wooden box line with velvet and provided with forces+ gloves. We customize casing according to our customer needs.